It was our first trip to Spain and we decided to set aside time for a nice dinner at a Michelin-starred restaurant in Barcelona as it would be too rushed in Madrid. Mandarin Oriental’s Moments, managed by chef Carme Ruscalleda (and her son Raül Balam) who has won seven Michelin stars for her restaurants in Spain and Tokyo, offers "creative, fresh and healthy cuisine inspired by Catalan culinary culture". Made reservations for four and brought or bought what we thought would be appropriate wear, only to realise upon arrival that we were overdressed. Ordered from the à la carte menu so everyone could eat what they wanted as the tasting menu was meant for the entire table. There was no variety of bread, neither served warm nor with butter, to choose from. Requested for olive oil and vinaigrette that took so long to arrive that we thought our request was forgotten. 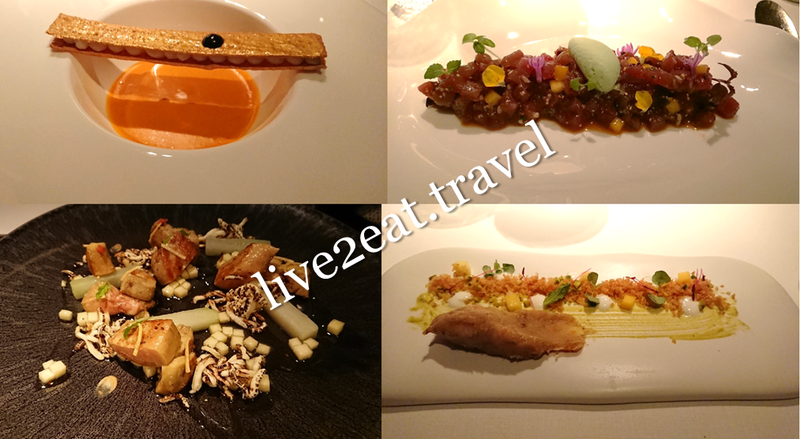 Liked how the mango cubes in my appetiser made the Mediterranean red tuna tartar with wasabi ice-cream less cloying. I tried a dining companion's succulent lobster with pistachio and coriander, and another's melt-in-the-mouth Foie Gras. While they were delicious, none was as good as both the amuse bouche served before this. With the exception of Zarzuela – traditional seafood stew with monkfish, squid, red prawns, hake and mussel, the other main courses we ordered were a tad disappointing. Parts of the stuffed squab or pigeon that was not so rare that I could not chew the meat apart, was tender while its accompanying sauce and stuffing of Duroc pork were too salty for my liking. Similarly for the Iberian pork with "migas monteras", paprika and black garlic. We ordered desserts to share as we were full but wanted to end the meal on a sweet note, forgetting there would be a petite four after that anyway. The pre-dessert palate-cleanser was lovely and we could neither rave about the chocolate with almond and coffee nor fault the banana split 2.0 with white chocolate, spicy vanilla and banana.